Bottom line: Learn how to calculate commissions in Excel for a basic tiered plan and rate table using the VLOOKUP function. Calculating commissions in Excel can be a very tricky task. This is especially true if you have tried to use multiple IF statements to calculate commissions for each tier in a rate table. This article will explain how to use the VLOOKUP function to make this process much easier. The secret is setting the last argument in the vlookup to TRUE, to find the closest match. Please checkout my article on How to Use VLOOKUP to Find the Closest Match for a detailed explanation on setting the last argument to TRUE. 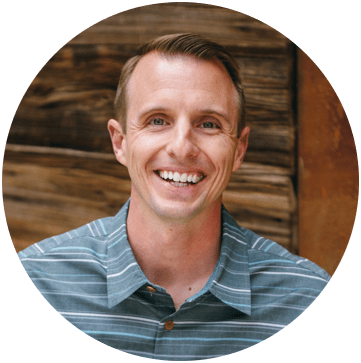 With a simple commission plan you typically have a rate table that lists the payout rate at each level of sales. As the sales rep makes more sales, his/her payout rate will typically increase. The payout rate could be a flat dollar amount, percentage of revenue, percentage of quota, etc. The job of the VLOOKUP is to find the rep's sales amount in the rate table, and return the corresponding payout rate. The rep will make a certain amount of sales during the month. He/she will earn a certain payout rate depending on the level of sales achieved. We can use a VLOOKUP formula to calculate the payout rate for a given sales amount (lookup value). For this to work we need to set the last argument in the vlookup [range_lookup] to TRUE. With the last argument set to TRUE, vlookup will find the closest match to the lookup value that is less than or equal to the lookup amount. This basically allows us to find a value between ranges of two numbers (tiers). When putting this rate table in Excel, you only need to list the tier minimum for the lookup range. Again the VLOOKUP will search for a “closest match” that is less than or equal to the lookup value. If it finds a value that is greater than the lookup value, then it will return the previous row. In this example for a commissions rate table, the first row in the lookup range needs to be zero. This is because the sales rep could potentially have sales of $0 and the lookup value would be zero. If the lookup value (sales amount) were a negative number, then the vlookup would return an error. It is important to know this and setup your rate table for all possible lookup values. If the sales amount is greater than the last row in the lookup range, then the vlookup will return the last row. For example, if the rep made sales of $175,000 then vlookup would return 15%. The payout can also be returned as a dollar value, instead of a percentage. With this setup the payout will be a flat rate. This means that the payout will be the same, regardless of what the sales amount is within the tier. In the example below, if the payout will be $1,000 if the sales amount is $55,000 or $95,000. The payout is NOT on a sliding scale. It is a flat rate for each tier. If you are looking for a sliding scale calculation, see my article on calculating commission with a tiered rate structure using SUMPRODUCT. A common approach to calculating commissions is using IF statements. With a rate table like this you would have to write multiple IF statements. You basically have to write one IF statement for each tier (row) in the table. You then have to join all the IF statements into one long and ugly formula. These are called nested IF statements. 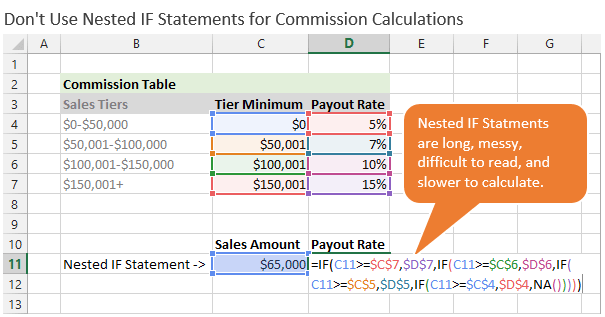 I always try to avoid nested IFs when possible because they are difficult to read and understand, and they can be slower for Excel to calculate. If you have thousands of nested IF formulas in your workbook, your calculation time could slow down. Using VLOOKUP is much easier and cleaner than using nested IF formulas. 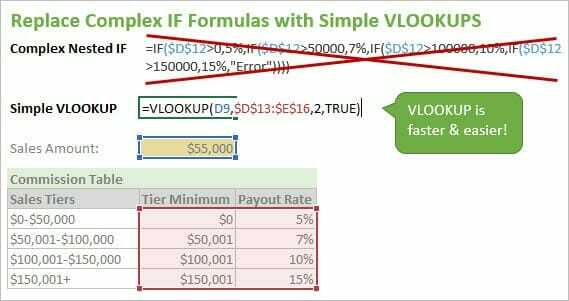 As you can see with this example, the vlookup allows you to use one formula to calculate the commission payout rate for any given sales amount. How Do You Use VLOOKUP with Closest Match? The vlookup with closest match technique can also be used for tax bracket calculations, price matching, etc. What do you use this technique to calculate? thank you so much for sharing this. I was using if but it has so many tiers. it’s painful. You just saved me so much time with the commission tiers! DEPOSIT	200500	0.25%	MIN RS2 MAX RS8	? WITHDRAWL	1500	0.50%	MIN 3 MAX 10	? MONEY TRF	5000	0.25%	MIN RS2 MAX RS8	? AEPS WITDRAWL	1000	0.50%	MIN 3 MAX 10	? FUND TRF	10000	0.25%	MIN RS2 MAX RS8	? Hi, I’m struggling to get a formula that works. Employee is paid a bonus depending on whether objective is met and at which tier. In order to be eligible for the bonus, employee’s objective must be 100% at the minimum. If the objective is between 100-109.99% and employee achieved a survey score below 935, then employee will only be awarded $500. If objective is met and employee achieved a survey score at or over 935, employee will be awarded $1000. If objective is at 110%+ and employee achieved a survey score below 935, then employee is rewarded $1000. If objective is at 110%+ and survey score is at or above 935, employee is awarded $2000. Commission 1% at min to $0. Ques? What is commission if product sells at $437? 12 months at 6%, = ? per month. 24 months at 7.5%, = ? per month. 36 months at 9.5%, = ? per month. 48 months at 11%, = ? per month. 60 months at 15%, = ? per month. Hi, I have slightly different scenario. Assume someone sells something worth $120,000. With this comp structure, $120,000 pays $7,700. $100,000 @ 7% and the remaining $20,000 @ 3.5%. What is the formula for this setup? I’d like to know this one too. Under the “Calculate Commissions to Return a Dollar Value” heading. Payout rate should be $500 not $1000 its in the wrong category. I am correct or incorrect? When the sales amount is $55,000 the payout is $1,000. I wanted to post a comment/question but needed to upload an example Workbook to illustrate. Is there any way to do that? Do to the volume of comments on the site, I’m not able to look at individual workbooks at this time. I apologize for the inconvenience. good night really need some help with excel this is my first time at it. I have 4 individuals, each with differing commission percentages of the total amount of commission. two of the individuals have a max out point, where they stop receiving a percentage of the total amount of commission. once they have maxed out and this is at different points in real time…. the percentages get proportionaltly get allocated to the other two employees. I have calculated with aN IF statement to return a commission amount for each employee. Question: i need to take into account the commission amount for each employee when that total amount of commission crosses the threashold for the max out point for the two employees? It will be a small varicance but the total commission for an employee will consist of differing percentages if in that month the amount of commission going to this sales department pushes the total into a different tier of commission [percentages. I have another article on commissions with rate tiers that might help. The SUMPRODUCT formula used there is definitely more complex, but the calculation is more complex as well. I created this pivot table: I need to calculate the commissions for each of the three individuals by month. It is one commission figure, 5%. You can probably just multiply the totals by 5%. This can be done with a calculated field in a pivot table. I hope that helps get you started. 1. Customer A buys a product $1000 and i give 100 referral coupons. 2. Referred customer B buys a product worth any amount , i want to give 10% commission to Customer A till it become $1000. So that Customer A gets back his purchase value as a commission. Request excel based formula for this. I have noticed you have some really helpful replies to the previous enquiries regarding there commission structure platform. I am hoping you can point me in the right direction too. I am currently selling a product at $169 with a commission structure with sales bonuses. I pay my reps a bonus full payment for the 8th sale and 13th sale. Rep receives full $169 for them sales. This is a daily commission incentive. Thankyou Jeff for reading and I hope you can help me with my template. How do I make a vlookup to report sales commission as a dollar value? Great question! You can change the percentages in column D to dollar values. This will pay out a flat rate when the rep achieves a certain tier. I added a section above with a screenshot and explanation for returning the dollar value. I also added a sheet to the example file with an explanation. If you want to calculate a cumulative amount, checkout my article on how to calculate commissions with a tiered rate structure using SUMPRODUCT. This is a more advanced formula, but that is required for that type of calculation. I want maintain commission of my team in excel can you suggest me. Helps to learn short cuts and new methods. I have a variation on the Bonus calculation formula – the Bonus Multiplier (BM)! Each month a sales rep has a Sales Target (S) and realizes an Actual revenue (A). The Bonus is 0.1% (B). Tried to use VLOOKUP but since the Tiers are variables that change per employee and per month, it is more complicated. When you say the tiers change per employee, is there any type of logic there? Why does each employee have a different tier structure? Maybe I’m not fully understanding your plan. Me again. Wow: my testing shows that the only time that IF outperforms VLOOKUP is when you only have two commission bands, meaning you can get by with just the one IF. So never use a nested IF. Use VLOOKUP instead. Hi Jon. You’ve shown IF in a slightly unflattering manner, because your IF formula is twice as complex as it needs to be. …which is slightly slower than VLOOKUP across 200,000 rows of data on your sample table, but there’s not much in it. That takes about 0.61 seconds to process across 200,000 rows of data. Your VLOOKUP: 0.36 seconds. Thanks for keeping me honest! 🙂 I was trying to show the longest, scariest, ugliest IF statement possible. But you are right, it can definitely be shortened and I will fix the image to show that. Besides calculation time, the IF statements are definitely slower to write and take more time to read. You are having to reference almost every cell in the table with the IF statement. With the VLOOKUP you are only need to reference two ranges (lookup value and lookup range). I’m not completely opposed to nested IFs, but in this situation the VLOOKUP can be more efficient and easier. Thanks again Jeff! As always, I really appreciate the comment.